The No. 2 Republican in the New York Senate was convicted Wednesday of lying to the FBI about arranging a high-paying job for his son. Sen. Thomas Libous showed no reaction when the federal jury's guilty verdict was read in a White Plains courtroom. With the felony conviction, the Binghamton Republican and the Senate deputy majority leader could be removed from office. Prosecutors said Libous lied seven times in 2010 to agents who were investigating government corruption, part of a U.S. attorney's crackdown that has led to the arrests of several New York lawmakers, including the former leaders of both houses, Republican Sen. Dean Skelos and Democratic Assemblyman Sheldon Silver. The agents were looking into how Libous' son Matthew got a $150,000-a-year job with a White Plains law firm in 2005. Libous denied any knowledge or involvement. But disbarred attorney Anthony Mangone testified for the prosecution that Libous promised to deliver business to Mangone's law firm -- enough to "build a new wing" -- in exchange for hiring his son. Mangone also said Libous arranged for an Albany lobbying firm to pay a third of his son's salary and funnel it through the law firm. "The senator did not want to have a lobbying firm paying his son directly," Mangone told prosecutor Benjamin Allee. "He said it wouldn't look good." Defense attorney Paul DerOhannesian attacked Mangone's credibility, noting that he was testifying in hopes of a light sentence for his bribery and extortion convictions. "You're a liar, aren't you?" he asked Mangone, who replied, "I have lied at times." The defense lawyer also noted that the only count against Libous was that he made false statements to the FBI. "No one has accused Tom Libous of kickbacks, bribery, or using his position to get a job for his son." 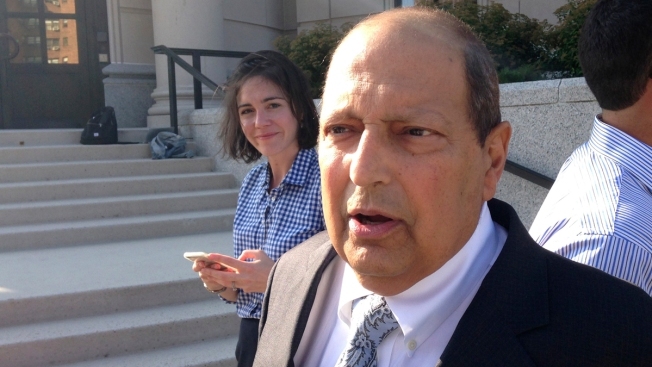 Libous, who is 62 and battling cancer, did not testify. He walked stiffly and used a specially padded chair in the courtroom. In a statement after the verdict, U.S. Attorney Preet Bharara said Libous "told lie after lie to hide the truth from federal agents investigating corruption in Albany." "Libous' lies have been exposed, his crime has been proven, and Albany will be the better for it," he said. Libous and his attorney did not immediately comment.